Just a quick post today to talk about Eclectic Elements Craft Thread. 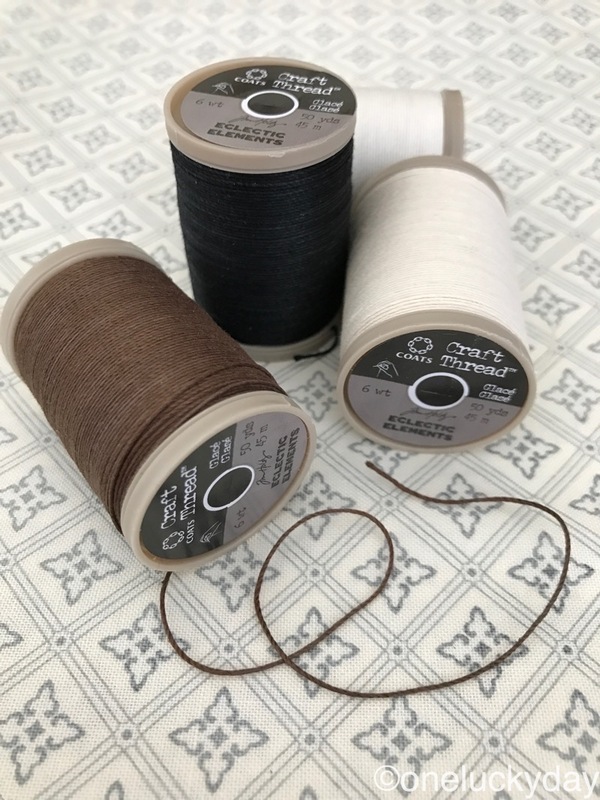 We introduced Craft Thread for use in hand stitching on sewing projects but I have found myself using it over and over in my everyday crafting projects. In fact I am using it extensively in my Christmas class this year. 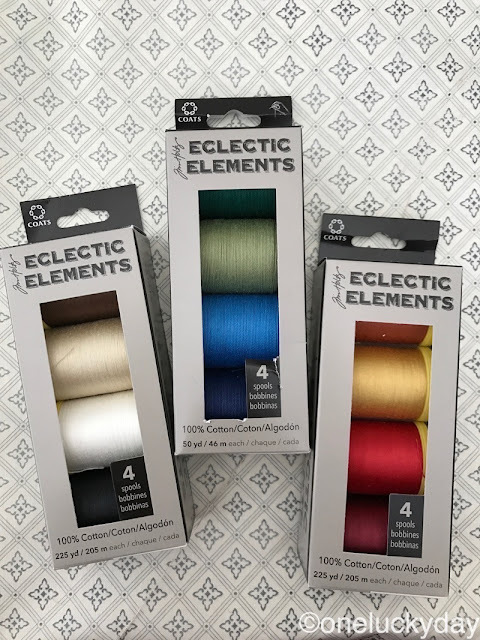 The Craft Thread is sold in three palettes made up of 4 colors each....you know the pack with the reds is my favorite. I created this stitched pillow for the spring Quilt Market. It was here that I really got to experiment with the Craft Thread using different stitches along with vintage lace and grain sacks. 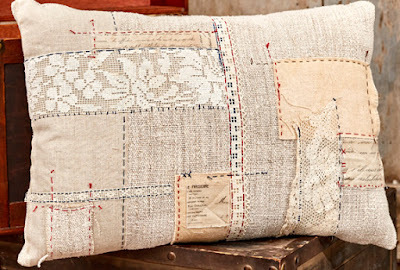 Annette Millard wrote a great blog post about the pillow and her experimentation with the Craft Thread. You can read it here. If you are a sewer, you can also download free project instructions for Airmail Patchwork Tote Bag using Eclectic Elements metal zippers and Craft Thread. This looks like a fun project! 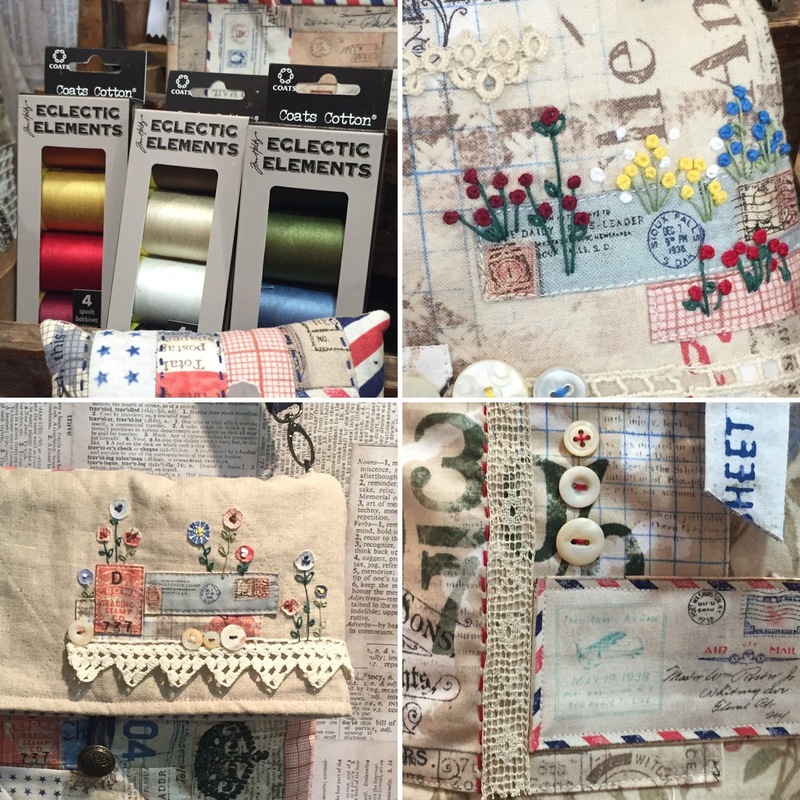 Hope these projects give you some ideas for using the new Eclectic Elements Craft Thread. Whether it's stitching or crafting...you are going to love it. I've not seen this in stores here. Don't know if the Doodle is carrying it. I would be partial to the blues and greens! Those are "my" colors! I didn't know Tim came out with thread but I've got to have some. The reds are my fav as well! Your stitched pillow is beautiful! I just picked up a pack of the neutral colors at hobby lobby. Can't wait to use it! great projects - hopefully the thread will hit northern Canada soon! is it a heavier weight? looks like perle cotton 12 weight - is it thicker than a single or double strand of embroidery floss? ... I'm all about the reds also! Thanks so much for the links, Annette's post was very interesting. I have not been able to track down the fabric or the Craft threads ... yet! You read my mind Paula, I was looking for the thread online yesterday, but couldn't determine the packaging or product numbers. I see in an earlier comment that someone found it at Hobby Lobby, I will try there. Thanks so much for the info. Very nice Paula where can one buy it? I'm so sorry I haven't visited in a while...I don't get your feed and so I forget. Your sewing creations for Tim are always fabulous...you blow me away. Have the threads is such an awesome idea. I will be purchasing these! Paula, your pillow is wonderful!!!!!!!!! I used my thread for the first time last night and fell in love! It's so thick and that is why I love it! 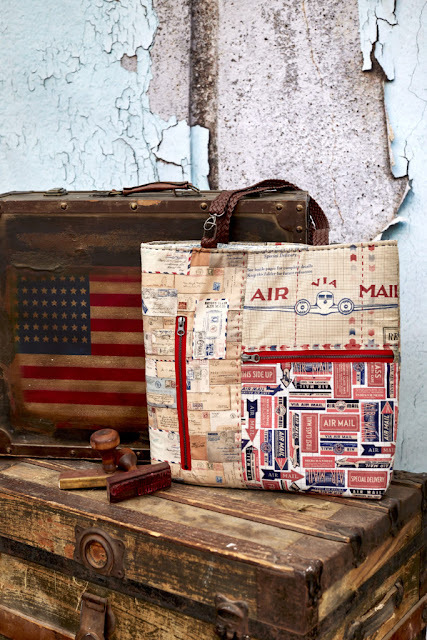 Your pillow and tote are wonderful. You are so talented. Enjoy Quilt Market!